The success of the current generation YZ250F is undeniable. In the short two year period since its redevelopment, we have seen the small bore YZ’s popularity soar to levels only matched when the model was first introduced in 2001. 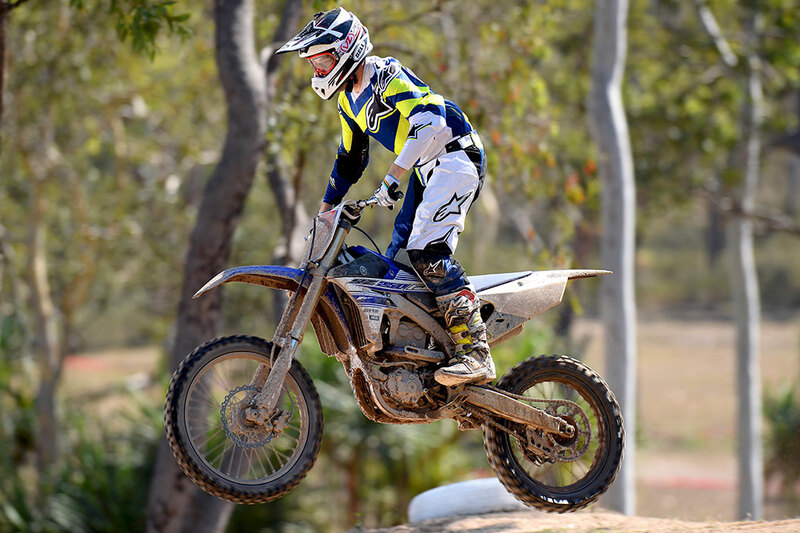 On the track the success story is much the same, Yamaha has wrapped up some of the most prestigious 250cc championships around the globe, including 2 straight AMA Motocross Championships at the hands of Jeremy Martin, and two straight Australian Motocross Championships from Luke Clout in 2014, and Jay Wilson in 2015. In case you’re still not convinced, check out the grid at your local motocross track, and be prepared to see a whole lot of blue. The 2016 YZ250F is a very refined package. There’s nothing new and ground breaking to be found, instead, it’s the small changes which add up to a noticeable improvement when compared to last year’s model. At least that’s what Yamaha is saying in its press releases. Yamaha’s development team focused on four main areas to work on the for 2016 model, improving the stopping power, improving the suspension feel, improving the mid-high rpm power and enhancing the overall ‘rideability’ of the engine. To give Yamaha riders more braking power, Yamaha added a 270mm disc to the front end, this replaced the old 240mm unit. The new disc is 30mm larger in diameter which greatly increases the power and feel of the front brake. Very similar units have been available in aftermarket form for some time now, so it’s great to see Yamaha step up and offer this as a standard spec item. The front brake pad material has also been changed to further improve feel and power. After taking feedback from racers around the world the Yamaha development team carefully worked on the KYB Suspension, with the aim being to improve feel by trying to remove the sudden kick or jolt that some people often commented on with the 2015 model. The suspension remains the same in overall design, no air forks here, it’s only the internal valving which has been ‘massaged’, if you will. The engine refinements begin with a new piston and conrod design. The piston has re-designed rib supports on the underside and the crown has been shaved back, removing 18 grams of piston weight. The conrod benefits from an improved heat treatment process which increases durability and the piston cooler sprayer has been redesigned to help lower the running temperatures of the YZ250F. Together, with EFI fuelling changes, these modifications mean more mid-high RPM power for the small bore Yamaha. Improving rideability is a tricky, delicate process. Yamaha Engineers, very smartly, took on the job of improving the balance within the YZ250F engine. Additional crankshaft counterweights have been added and a redesigned balancer shaft is fitted to help to reduce vibration, and give stronger, smoother power to the high revving YZF. Improvements in the manufacturing process, give the clutch boss a more accurate and efficient operation, while a new shifting mechanism offers more accurate gear shifts while the engine is under load. Moving beyond the four key areas of improvement for the YZ250F, the only remaining changes are some bold new graphics which give the Yamaha a cool new look, and if you’re after something different, the YZ also comes in 60th anniversary yellow. The YZ250F is an impressive bike on the track. Moments after take-off you will quickly notice how lively and responsive the reverse fed, fuel injected engine is. Off the bottom the YZ is strong and things quickly transition into a punchy mid-range. This is where the YZ shines, putting power to the ground, coming out of turns and propelling you onto the next obstacle ahead. If the RPM’s drop off, a quick flick of the clutch will get most riders out of trouble and get you back into that meaty power hit. Changes when compared to the previous model, are noticeable as the RPM’s climb beyond the mid-range. The YZ now feels more “revved up” as you climb towards full throttle. It’s small things that can add up, and it looks like Yamaha got it right with the 2016 engine. The new brakes work exactly as they should, with the 270mm front rotor adding the power and feel that the Yamaha has been lacking for a few years now. The KYB suspension may seem a bit dated when compared to the air fork craze that appears to be going on with some of the other OEMs. But when it comes to on track performance the twin chamber, mechanical spring forks work wonders. Again, the small things add up, with the 2016 fork and shock feeling a little more compliant than in years gone by. 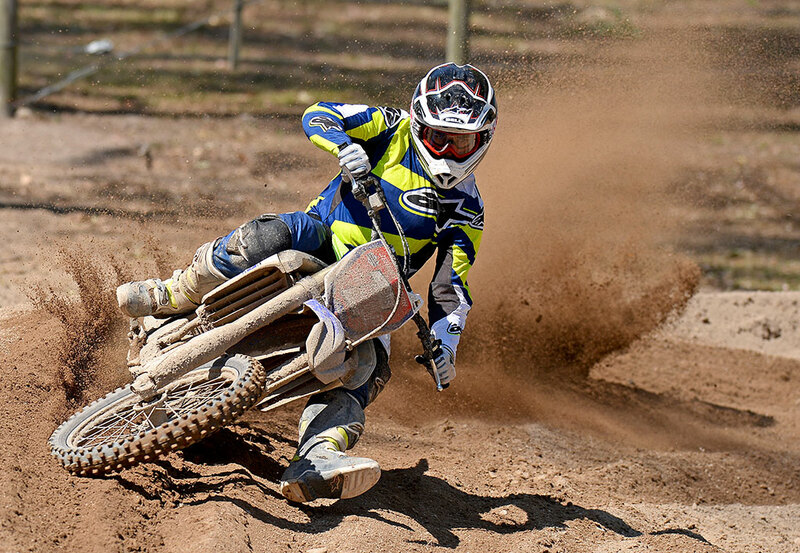 Lighter riders may feel the setup is a little bit stiff, but from our experience on the day of our test, a few clicks on the suspension can provide exactly the change you might be looking for. The agility and turning capability of the Yamaha is certainly improved with the suspension changes Yamaha have made. The YZ is now more settled through turns and under brakes, with improved traction making it easier to feel what the bike is doing underneath you. It’s a bit cliche to say, but when you ride the YZ250F its has a very refined and perfected feeling to it, just like Yamaha say in their brochures. The Yamaha does everything very well on the track, and in standard form it’s surprising how capable the small bore thumper really is. If you’re looking to change brands, the YZ250F is certainly a contender for the best 250 four stroke out there with all the features you’ll be looking for. It’s ready to go straight off the showroom floor and won’t need thousands of hard earned dollars spent to get it up to race spec. If you’re just looking to update from your old YZ250F, don’t be shy, as the 2016 is a cut above the previous model and will be a sure thing to impress you.